Join us on a guided bike adventure through Santa Monica and the historical streets of Venice Beach, California. 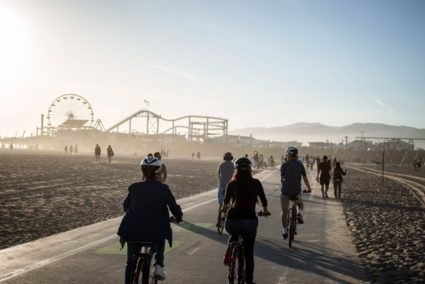 Hitting the iconic Santa Monica beach bike path, and Santa Monica's charming Third Street Promenade, we’ll explore the sites around this unmissable Los Angeles destination and take in some privileged views of the California coast before continuing our bike ride south towards Venice. While perhaps most recognized as the birthplace of skateboardingand training grounds for a young Arnold Schwarzenegger, Venice Beach is also home to stunning architecture, sculptures and West Coast graffiti walls that have become alluring grounds for world-renowned artists. Riders will also be given some time to walk along the colorful Venice Boardwalk to purchase souvenirs and watch live street performances. Afterwards, you'll pedal through the picturesque Venice Canals, the quaint Italian inspired community, and then bike through Abbot Kinney Blvd, Venice's trendy gathering place for both locals and visitors, labeled by GQ Magazine as "the coolest block in America". Our guides will show you these often overlooked sights and provide interesting and insightful information about the culture, communities and history of the area. *Participants are expected to know how to ride a bike. This tour travels through a separated bike path and bike lanes on city streets. *Infants (2 years and under) only pay for the cost of a baby seat rental. *Tips and gratuities not included. If you enjoyed your time on the tour and feel your tour guide has demonstrated great expertise and service, common practice within the travel industry is to tip 10% to 15% of the retail price of the tour. Tipping is voluntary and always greatly appreciated!